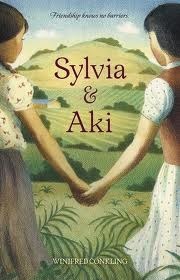 Sylvia & Aki has a subtitle on the cover that reads: “Friendship know no barriers.” The story, however, is not really about the friendship between the two girls. It is told in alternating narrations by Sylvia Mendez, a young Mexican-American girl whose family is leasing a farm in Southern California in the 1940’s and who is refused admittance to the neighborhood school. She and her brothers are told they must go to the ‘Mexican’ school near the barrio instead. The other narrator is young Aki Munemitsu. Aki’s family owns the farm which the Mendez family is leasing. They have been forced to abandon their home and possessions–allowed to bring only one suitcase–and relocate to a Japanese internment camp after the Japan bombs Pearl Harbor in 1941 during World War II. The words made her feel sick….That sign is talking about me, she thought. Dogs and Mexicans and me. The sign gnawed at Sylvia all afternoon and into the evening. Before drifting off to sleep that night, she stared at the ceiling and thought about how those four little words could hurt her so much. Sylvia’s father protests the city’s ‘rule’ that his children could not go to their neighborhood school because of the color of their skin–regardless of the fact that they were American citizens born in the United States and spoke English as a first language in addition to Spanish. Gonzalo Mendez’s lawsuit against Orange County and the Westminster School District was pivotal in ending segregation of schools in the state of California and later in the landmark Brown v. Board of Education which ultimately resulted in a federal mandate to do the same throughout the country. Aki’s story is one American children seldom hear about until much later in their education. I don’t think I was aware of the existence of the Japanese Internment camps during World War II until junior–or perhaps even high–school. And I know when I found this had happened in this country I was appalled. Aki’s story of being separated from her father and her descriptions of the stark contrasts between her life before Pearl Harbor and then inside the reprehensible Internment Camp are heart-wrenching. She makes it easy for the reader to imagine herself there as well. “How am I a threat to national security?” Aki had asked. As Aki helped her mother pack, the wrongness of it all swept over her. Aki and Sylvia do actually meet briefly: once at the Camp when Sylvia’s father delivers the rent money to Aki’s mother personally (in order to make sure no officials take the money before it reached them) and when Aki and her family finally return to the farm. They go their separate ways a few days later. It is clear that their impact on each other’s lives was transformative due to their own character and the circumstances in which their lives crossed. Given the title, I expected more about their lives together as friends. Perhaps it is due to this expectation that I felt a little let down by the storyline when the book ended. That aside, Sylvia & Aki is well-written with genuine voices from both girls as they relate their stories. It could easily provide a jumping off place in a classroom or dinner table discussion about segregation, the damage that fear and hate can do and the importance of finding your voice for justice and kindness and peace in our world.